Trick or Treat! 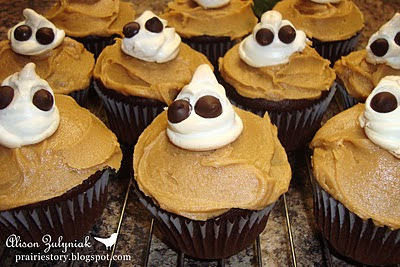 These cute Halloween cupcakes remind me of Reese's Peanut Butter Cups - one of my favorite Halloween candy bars. Sooo good! - Bake cupcakes as per directions on box, in lined cupcake pans. - Prepare frosting by creaming together peanut butter and icing sugar, then adding in milk and vanilla. Set aside. - Beat eggs whites until soft peaks form. Add sugar then beat until stiff peaks form. Fold in corn starch. Spoon meringue into plastic bag, cut corner to create hole. Squeeze meringue out on baking sheet lined with foil and greased with cooking spray, to form 24 ghost shapes. Add 2 chocolate chips to each for eyes. Bake @ 350° for 10-12 minutes. Let cool. - Once cupcakes have cooled, ice with frosting, and top with meringue ghost. - Makes 24 cupcakes. Boo! Great idea! Love how simple and adorable these are. Thanks for sharing and Happy Halloween!!! Alison, they are so cute! I bet they are so yummy too! How cute are these!? The chocolate peanut butter combo is always a winner and the colors are so Halloween-y too! I love choc/pb combo - my favorite. And those little ghosts are so cute. Who wouldn't want one of those! i love chocolate and peanut butter, they all look so yummy! These ghosts are ALMOST too cute to eat! Almost, because nothing stops me from my pb-chocolate fix! LOL! These are adorable and I looove chocolate and peanut butter 'together' more than anything!!! wow so sweet cupcakes. I really love chocolate and peanut butter cupcakes.They all looks so yummy. Thanks for sharing the yummy post with us.